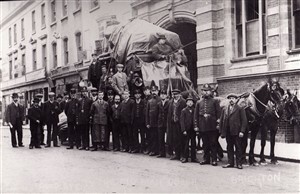 Last mail coach to leave Ship Street post office. Daddy Long Legs leaving the Paston Place station. 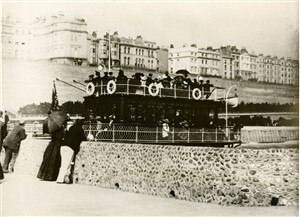 East Brighton Seen was officially opened on Saturday 5 May 2007 by Lord MacDonald of Tradeston, perhaps better known as broadcaster, local resident and Victorian photography enthusiast Gus MacDonald. We're hoping to let you see a gallery of photos from the event but there just aren't enough hours in the day! 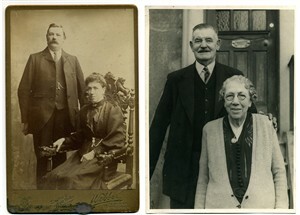 Here's a little taster of some of the 150 photographs we have been given since we opened! This unique exhibition of historical photographs has grown into a fascinating celebration of community history - we've knitted maps, eaten homemade cakes, shared stories, and listened to 2 speakers a day! We think we've succeeded in video-recording them all. This page was added on 10/05/2007.